Before 1918, women were not allowed to vote. 2018 is the 100 year anniversary since British women over the age of 30 won the right to vote. These websites and video clips tell the story of the fight for women's rights. This clip may not be available where you are due to BBC copyright restrictions. Click on a topic below "Overview" or for a timeline, click on "Key dates" in the menu on the left. See newsreels and photos of suffragettes from the early 1900s, the years described in the book. The clip starts with a segment about the suffragettes then covers events in the US before returning to the the suffragettes. The clip has no sound. Click on a photo to see a bigger picture. Mouse over each photo to see the names of the people in the picture. Click on "Next" below the comic to continue. The early 1900s is also known as the Edwardian era. Click on topics in left menu. What would your life have been like in Edwardian times? Includes Internet links to recommended websites where readers can find out more about the suffragettes. Visit the author’s website, www.lindanewbery.co.uk, for more information. In this lively story, Linda Newbery provides an excellent introduction to the changing role of women in the 20th century. The new tenants represent opposing views of the fight for women’s suffrage. Edwina believes in direct action and finds herself in prison being force-fed, released under the notorious Cat and Mouse Act and the re-arrested. Violet is a supporter of Sylvia Pankhurst and more concerned about the terrible working conditions in the East End. Polly’s mother will not go against her husband openly but is a secret sympathizer, and Polly herself represents the new generation. All the characters have fully rounded personalities – Linda Newbery is far too good a writer to offer her readers mere stereotypes. Recommended for girls of 8-10. Linda Newbery is one of three established authors who have created the Historical House series, which looks at the lives of the inhabitants of a house in Chelsea during three periods in history. Adele Geras kicks off the story in 1857 with Lizzie visiting her cousins in London, the elder of whom has been inspired by Florence Nightingale. By 1914 the house is divided into flats and Linda Newbery takes up the story with Polly befriending a couple of suffragettes who move in. The final story is set in 1941, when Ann Turnbull’s heroine Josie is staying with her cousins to escape being ostracised when her brother Ted becomes a conscientious objector. All three books stand alone, but girls of eight to 11 will want to read them all and will enjoy the historical detail in each. The three stories in The Historical House series share a setting while exploring an individual period. In Adele Geras’ Lizzie’s Wish, girls seek education and an active role in society, while their successors in Linda Newbery’s Polly’s March are after the vote. By the time of Ann Turnbull’s Josie Under Fire, surviving the London blitz and a changing world order has a become the preoccupation. Historically strong, these are also dramatic stories with a real sense of atmosphere. Brilliant book based upon 6 Chelsea Walk, a London house with a mixed history. Three different authors set their books in different times 1764, 1857, 1895, 1914, 1940 and 1969 but the house always forms the background to the lives of the girls who live there. Polly is the heroine of Linda Newbury's book. She becomes friends with two suffragettes who live on the top floor and are involved in the 'Votes for Women' campaign and, as the relationship develops, she begins to question the opinions and views of her family and their circle. 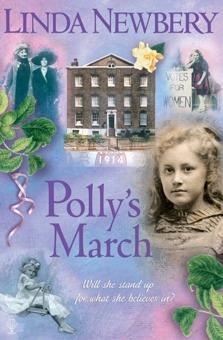 If anyone can make history come alive for younger readers, it’s Linda Newbery and Polly’s March... does that superbly. I was interested in this book because I am studying the changing role of women in history. The book was excellent, I really enjoyed it. I have already bought the next two. I find this book really truly interesting. I've found out a lot about suffragettes from this book as well. When I was reading I really got an image in my head of what it was like from the description that Linda Newbery put in. It's a wonderful book and I would like to read more about the historical house in the series. I really liked this book because it was an entertaining and interesting read. I particularly liked the way the author put a good clear picture in my head. It taught me lots about suffragettes and what people thought of them. My favourite part is where Polly herself becomes a sort of suffragette. I would give it 9 out of 10.